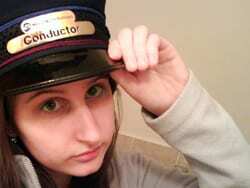 If I haven’t mentioned it before, I don’t really like trains. Really, I don’t. Trains are a means to getting somewhere, and you can often meet intriguing people aboard, but the mechanical object that is a train doesn’t really interest me. The thing that interests me about trains though, is how they effect people and place. Over its long history, as New York City’s first railroad – chartered in 1831, the New York & Harlem Railroad (todays Harlem Line) has undeniably had a significant influence on the towns it traversed. The railroad was an important catalyst for the growth of Westchester County over the late 1800’s and early 1900’s – and Scarsdale is no exception. The town of Scarsdale, named for the ancestral home of land owner Caleb Heathcote, was mostly farmlands before the railroad arrived in 1846. In fact it was so rural the entire population of the town numbered 255, mostly farmers, in 1840 (today’s population numbers over 17,000). Due to increased demand, by 1877 train service to Scarsdale was regularly scheduled and reliable. In 1891 the Arthur Suburban Home Company purchased a 150 acre farm and began subdividing it into lots – marking the beginning of large scale suburban development in the town. The first influx of residents were wealthy New Yorkers who built estates and used the train to commute to the city. Today’s Scarsdale station was completed in 1902 and was designed by Reed & Stem. I’ve mentioned Reed & Stem several times before, as they have designed a few stations along the line, including Tuckahoe and Chappaqua, and also did work on Grand Central Terminal. Their design was in a neo-Tudor style, the first building in Scarsdale with that style. Many buildings later completed in the commercial areas of the town mimicked it, and today Scarsdale is known for the style. It is definitely a beautiful area, and was a well-enjoyed stop on my tour of the Harlem Line’s stations. 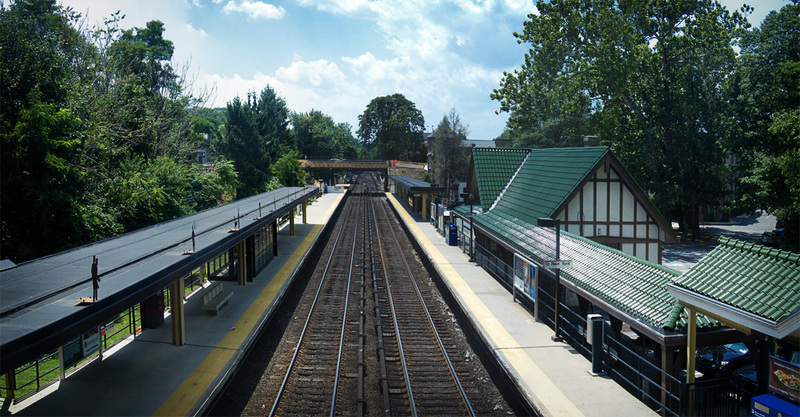 Neighboring station Hartsdale is sort of like a younger twin brother to Scarsdale – Hartsdale’s station also mimicked Scarsdale’s neo-Tudor style. The two also share a companion Arts for Transit piece, comprised of silhouetted figures, by Tom Nussbaum. Scarsdale’s portion is called Travelers, and the figures are located on the top of the platform canopies. This is my stop, and my favorite feature of the station area is the fact that the Bronx river parkway bike/walking path is just steps of the train. There’s also a small waterfall (http://tinyurl.com/sdwaterfall), which from what I’ve seen is pretty unique to the Scarsdale stop. It’s a great place to sit and relax if your early for a train. Growing up in Scarsdale that brought back memories! The station was a place EVERYONE knew, so it wasn’t uncommon to meet up with friends down BY the station (near the station house) or UP at the station, on East Parkway near the cab stand. The little shops in the area DOWN by the station used to have a great little coffee shop that could get you breakfast and out the door for the 8:04 express to GCT. Interesting note, the mile marker next to the northbound platform, was found in a junkyard and restored by someone earning his eagle scout community service project. This station looks fabulous. So beautiful on both sides. Love looking up and down the stations you take pictures of.